And so it begins. The long task of hand quilting this baby, stitch by stitch. I started with a lovely 28 wt. 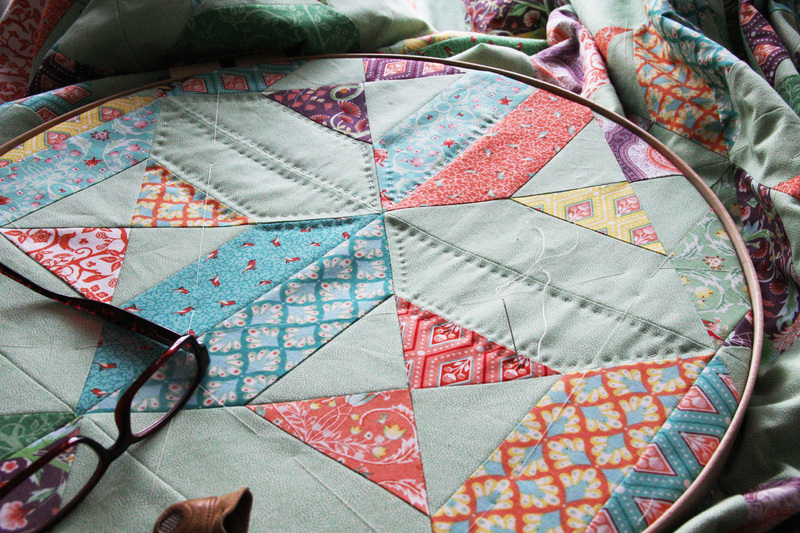 Aurifil, which I would highly recommend for machine quilting. But after a few minutes, I switched to a much heavier weight (8) Valdani cotton. I agonized over the two threads for a long time, finally consulting my husband who asked what would happen if I mixed them, or if, heaven forbid, I decided to machine quilt about half way through. What if you get bored, he asked, or frustrated, or your hands seize up from the constant grip of the needle, or carpel tunnel sets in, or arthritis? Will the quilt police come after you?? I thanked him for all the positive encouragement and cursed the fact that he knows me too well. Meanwhile I decided on the Valdani. It will be a wee bit more expensive, but I love the obvious hand sewn look. At a size 8, this thread simply will not go through a machine, at least not as a top thread, and therefore is only used for hand work. I just wanted something that could not be purchased anywhere. 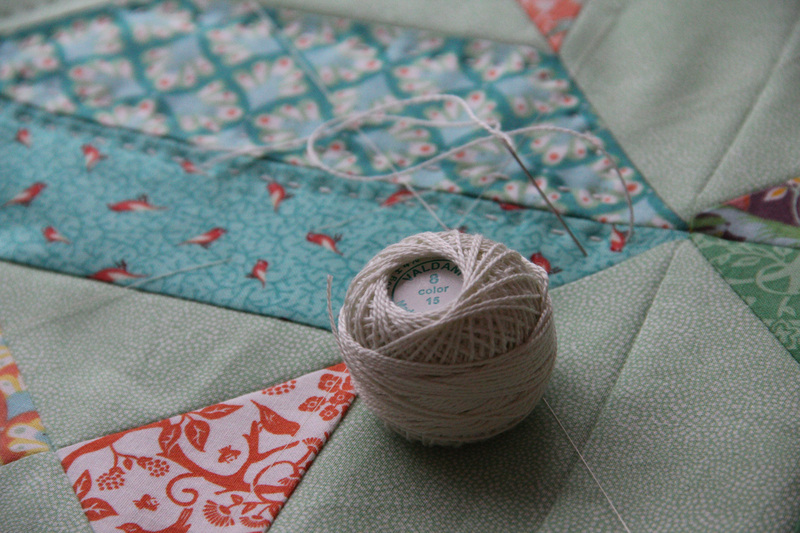 So, yes, as crazy as it may seem, I’m going with the large thread and the hand quilting. According to my calculations, it takes me a steady 1 hour to complete a block, and in the quilt there’s approximately 108 blocks, plus the border. 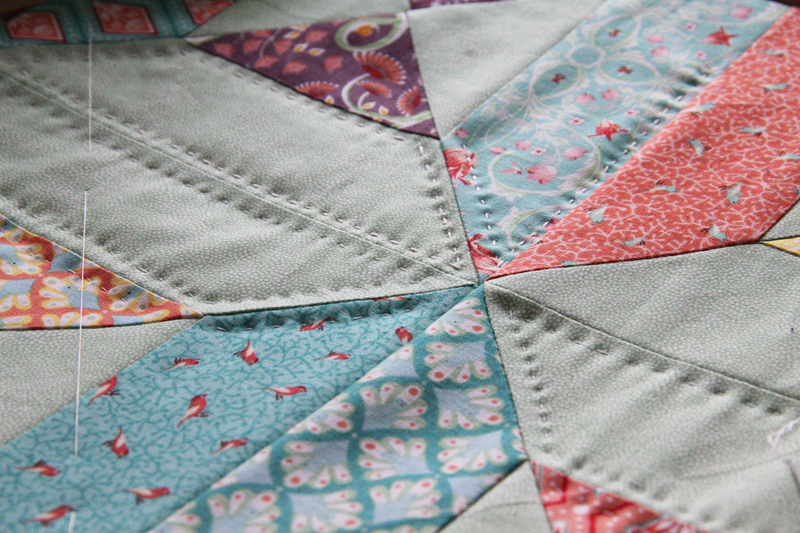 I would have no problem machine quilting the border, but for kicks, let’s add it in. 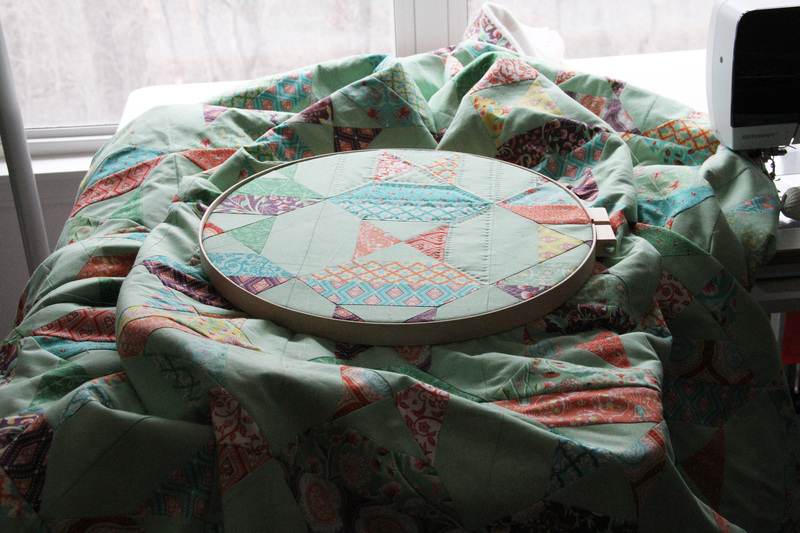 If I worked an hour every single day, I could complete the quilting in 4 months. Skipping days here and there, 6 months. Realistically… one year. So, boys and girls, this is not a project for the instant gratification crowd. This is an endurance sport. If you haven’t noticed, I’m trying to psych myself up for the task. Even though I have lots of other projects I want to work on in between bouts of hand quilting, and you know, life. I won’t bore you with the ongoing work, at least not too much. I’ll just give you occasional updates. So call me crazy. Or call me overextended. Just don’t call me late for dinner. This entry was posted in Creativity, quilting, sewing by edges. Bookmark the permalink.